Bechet was born in New Orleans in 1897 to a middle-class Creole of color family. His older brother, Leonard Victor Bechet, was a full-time dentist and a part-time trombonist and bandleader. Bechet learned several musical instruments that were kept around the house, mostly by teaching himself; he decided to specialize in the clarinet. At the age of six, he started playing with his brother's band at a family birthday party, debuting his talents to acclaim. Later in his youth, Bechet studied with Lorenzo Tio, "Big Eye" Louis Nelson Delisle, and George Baquet. Bechet played in many New Orleans ensembles using the improvisational techniques of the time (obbligatos with scales and arpeggios and varying the melody). He performed in parades with Freddie Keppard's brass band, the Olympia Orchestra, and in John Robichaux's dance orchestra. From 1911 to 1912, he performed with Bunk Johnson in the Eagle Band of New Orleans and in 1913–14 with King Oliver in the Olympia Band. From 1914 to 1917 he was touring and traveling, going as far north as Chicago and frequently performing with Freddie Keppard. In the spring of 1919, he traveled to New York City where he joined Will Marion Cook's Syncopated Orchestra. Soon after, the orchestra traveled to Europe; almost immediately upon arrival, they performed at the Royal Philharmonic Hall in London. The group was warmly received, and Bechet was especially popular. While in London, he discovered the straight soprano saxophone and developed a style unlike his clarinet tone. His saxophone sound could be described as emotional, reckless, and large. He often used a broad vibrato, similar to what was common among some New Orleans clarinetists at the time. On July 30, 1923, he began recording. The session was led by Clarence Williams, a pianist and songwriter, better known at that time for his music publishing and record producing. Bechet recorded "Wild Cat Blues" and "Kansas City Man Blues". "Wild Cat Blues" is in a ragtime style with four 16-bar themes, and "Kansas City Man Blues" is a 12-bar blues. On September 15, 1925, Bechet and other members of the Revue Nègre, including Josephine Baker, sailed to Europe, arriving at Cherbourg, France, on September 22. The revue opened at the Théâtre des Champs-Élysées in Paris on October 2. He toured Europe with various bands, reaching as far as Russia in mid-1926. In 1928, he led his small band at Chez Bricktop in Montmartre, Paris. He was imprisoned in Paris for eleven months. In his autobiography, he wrote that he accidentally shot a woman when he was trying to shoot a musician who had insulted him. He had challenged the man to duel and said, "Sidney Bechet never plays the wrong chord." After his release, he was deported to New York, arriving soon after the stock market crash of 1929. He joined Noble Sissle's orchestra, which toured in Germany and Russia. In 1932, Bechet returned to New York City to lead a band with Tommy Ladnier. The band, consisting of six members, performed at the Savoy Ballroom. He went on to play with Lorenzo Tio and also got to know trumpeter Roy Eldridge. In 1938 "Hold Tight, Hold Tight (Want Some Seafood Mama)", commonly known as "Hold Tight", was composed by Bechet's guitarist Leonard Ware and two session singers with claimed contributions from Bechet himself. The song became known for its suggestive lyrics and then for a series of lawsuits over songwriter royalties. In 1944, 1946, and 1953 he recorded and performed in concert with the Chicago jazz pianist and vibraphonist Max Miller, private recordings that are part of Miller’s archive and have never been released. These concerts and recordings are described in John Chilton's biography Sidney Bechet: The Wizard of Jazz. With jobs in music difficult to find, he opened a tailor shop with Ladnier. They were visited by musicians and played in the back of the shop. In the 1940s, Bechet played in several bands, but his financial situation did not improve until the end of that decade. By the end of the 1940s, Bechet had tired of struggling to make music in the United States. His contract with Jazz Limited, a Chicago-based record label, was limiting the events at which he could perform (for instance, the label would not permit him to perform at the 1948 Festival of Europe in Nice). He believed that the jazz scene in the United States had little left to offer him and was getting stale. In 1950 he moved to France, after his performance as a soloist at the Paris Jazz Fair caused a surge in his popularity in that country, where he easily found well-paid work. In 1951, he married Elisabeth Ziegler in Antibes. In 1953, he signed a recording contract with Disques Vogue that lasted for the rest of his life. He recorded many hit tunes, including "Les Oignons", "Promenade aux Champs-Elysees", and the international hit "Petite Fleur". He also composed a classical ballet score in the late Romantic style of Tchaikovsky called La Nuit est sorcière ("The Night Is a Witch"). Some existentialists in France took to calling him le dieu ("the god"). Shortly before his death, Bechet dictated his autobiography, Treat It Gentle, to Al Rose, a record producer and radio host. He had worked with Rose several times in concert promotions and had a fractious relationship with him. Bechet's view of himself in his autobiography was starkly different from the one Rose knew. "The kindly old gentleman in his book was filled with charity and compassion. The one I knew was self-centered, cold, and capable of the most atrocious cruelty, especially toward women." His playing style was intense and passionate and had a wide vibrato. He was also known to be proficient at playing several instruments and a master of improvisation (both individual and collective). Bechet liked to have his sound dominate in a performance, and trumpeters found it difficult to play alongside him. ^ a b Porter, Lewis; Ullman, Michael (1988). "Sidney Bechet and His Long Song". The Black Perspective in Music: 135–150. doi:10.2307/1214805. JSTOR 1214805. ^ Porter, Lewis; Ullman, Michael (1988). "Sidney Bechet and His Long Song". The Black Perspective in Music. 16 (2): 135–150. JSTOR 1214805. ^ Cohassey, John. "Sidney Bechet". www.encyclopedia.com. Retrieved 10 September 2018. ^ Palmer, Robert (1976). Sidney Bechet: Master Musician (Media notes). Bluebird Records. ^ "The struggle in Paris". My Life - Sidney Bechet. Retrieved 10 September 2018. ^ a b c d Horricks, Raymond (1991). Profiles in Jazz. New Brunswick, New Jersey: Transaction. pp. 1–10. ^ Chilton, John (1987). 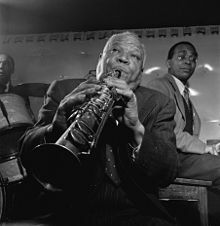 Sidney Bechet: The Wizard of Jazz. Macmillan. ISBN 0333443861. ^ Filan, Kenaz (2011). "Appendix 2". The New Orleans Voodoo Handbook. Rochester, Vermont: Destiny Books. ISBN 978-1594774355. ^ "Radio Swiss Jazz - Music database". Retrieved 2018-04-01.